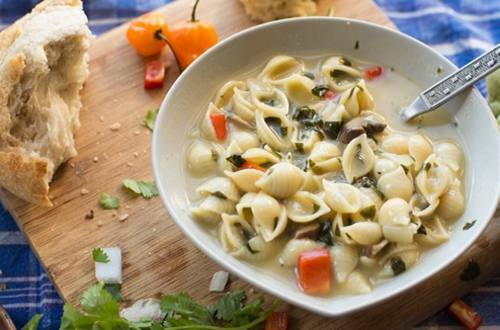 Take a culinary trip to Florence with our Florentine Garlic Shell Soup. After a few bites you won’t want to come back. 1 Melt Spread in 3-quart saucepan over medium-high heat and cook onion, stirring occasionally, 1 minute. Stir in red pepper and mushrooms and cook, stirring occasionally, 4 minutes or until vegetables are tender. Stir in spinach and cook, stirring occasionally, 1 minute. Add broth and bring to a boil over high heat. Stir in Knorr® Italian Sides™ - Creamy Garlic Shells and continue boiling over medium heat, stirring occasionally, 11 minutes or until pasta is tender. Garnish, if desired, with grated Parmesan cheese.